Each presentation finishes with a well-deserved burst of applause. The cheering of family members, friends, and staff is a celebration of four years of learning, reflection, and hard work by the senior standing in front of their audience. 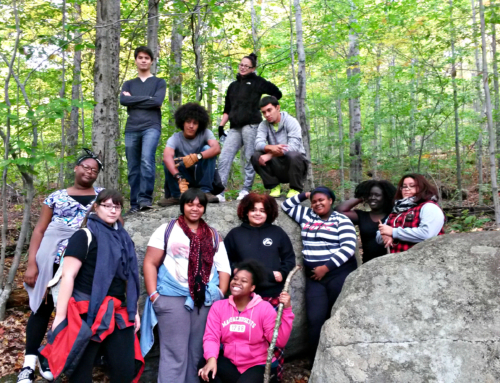 Environmental Leadership Portfolio work begins in 9th grade and culminates with the Senior Defense, a uniquely Common Ground rite of passage. 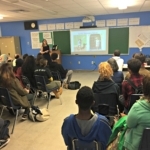 The defense is a presentation that highlights core experiences during each seniors’ time at Common Ground and draws on academic study, afterschool program participation, Green Job Corps internships, and out of school experiences and learning. 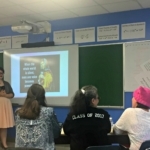 The very personal nature of the process allows each student to offer something in their defense that is wonderfully and uniquely theirs. It is an opportunity to present the story of their growth as a leader during their time with us. 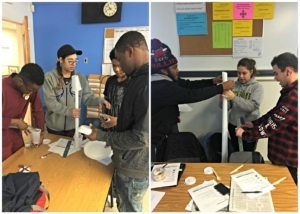 SSJE students engage in a tower building activity that develops teamwork and challenges students to pay attention to process and relationship while trying to achieve their result. Our Leadership Portfolio process is a major component of how we fulfill on our commitment to cultivating Environmental Leadership in our students. 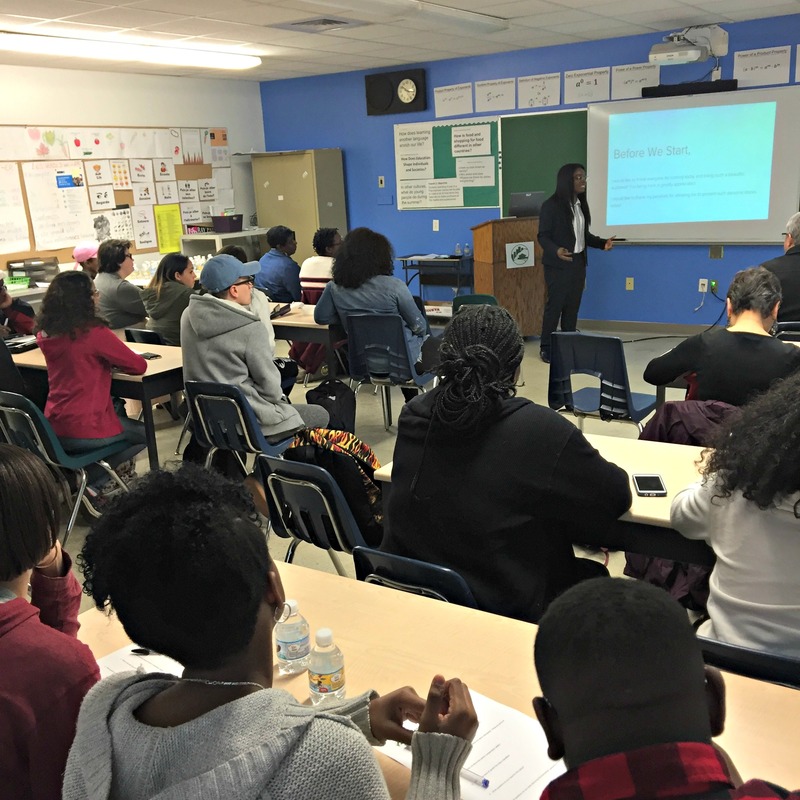 In addition to offering a wide variety of career and college related experiences as part of their Portfolio, we also spend intentional time developing the unique leadership of each of our students. 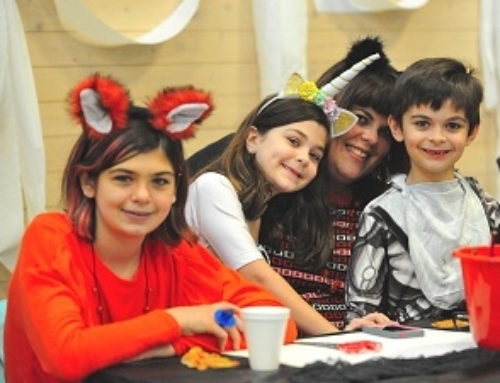 Rooted in the core belief that all students can lead and learn at high levels, we build age-appropriate experiences into guidance for each grade that invite students to reflect on their own learning in and out of the classroom as well as engage in team and leadership building activities. 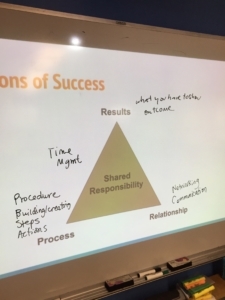 At each grade level, students have end of year milestones for written reflections related to their experiences which are entered into student leadership portfolio websites. These reflections focus on academic and extracurricular experiences that students deem significant to them and their growth as a leader. 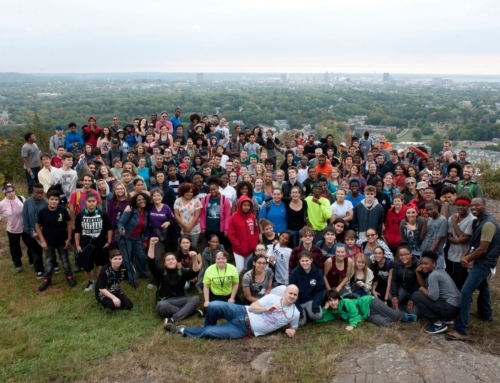 Each entry reflects student learning and growth in connection to our Environmental Leadership Standards that focus on five core values: Pride, Ownership, Wonder, Effort, and Respect. Seniors in SSJE use a model of success from The Interaction Institute for Social Change, talking about how process, relationship, and results are all dimensions of success. Students are also asked to reflect on the ways in which they have made sustainable changes in themselves and in their communities. Freshmen focus on sharing about themselves and developing their definition of leadership. Sophomores continue this process of crafting a personal definition of leadership and add 3 reflection entries into their website. 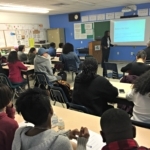 Spring midterms for sophomores include a presentation to their guidance teacher and families about their growth as a leader so far. Juniors take a deeper dive into college exploration and complete a job shadow as part of career readiness. 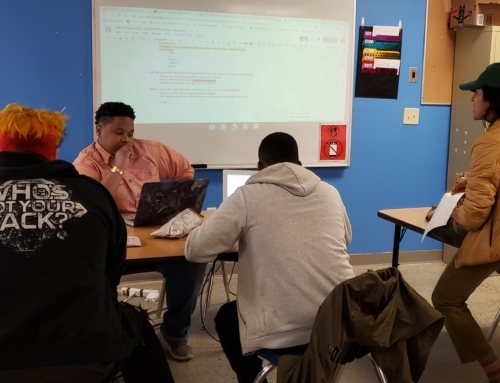 Seniors embark on the Senior Social Justice Experience class with eight written reflections in their portfolio website about their growth as a leader. 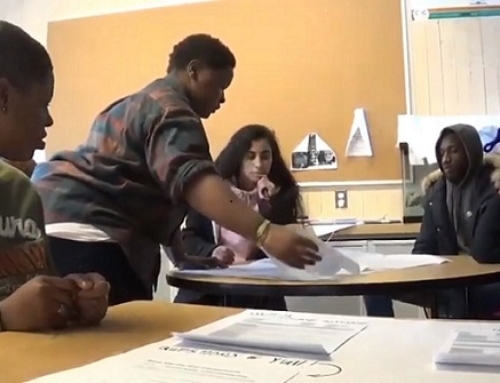 Each year, Seniors work incredibly hard to prepare their Portfolio Defenses. The presentations are consistently powerful, poignant, and inspiring. So far, this year has been no different as 25 seniors have completed and passed their defenses with the remaining seniors defending next week. 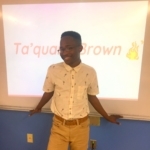 Ta’quann Brown talked about his experiences working with young people that helped him tap into his own skills and wisdom as a leader through empowering the leadership of children younger than him. Keilly Solano presents to a full house, talking about the ways in which her playful, creative side and her formal, academic side have merged into one during her time here at Common Ground. Keilly is an organizer and actor who will be pursuing study at Southern next year. 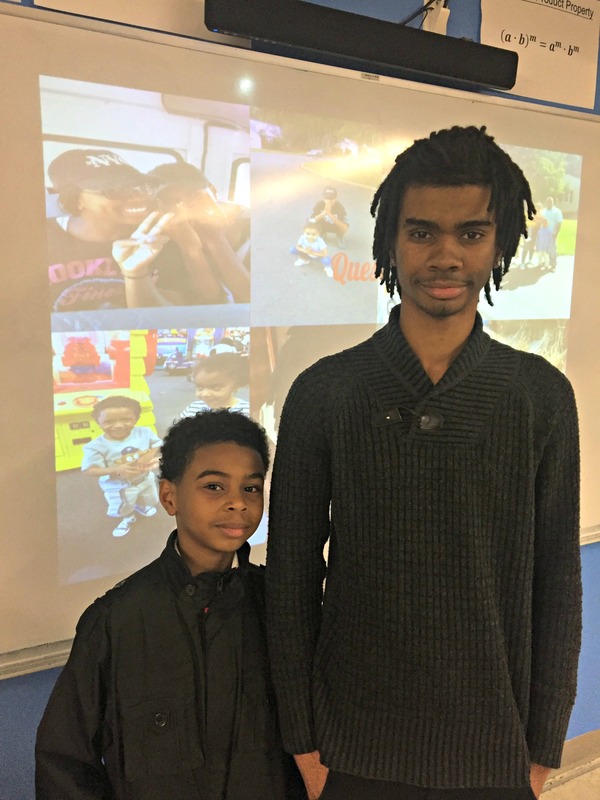 Kentea Hobby celebrates his defense with his younger brother who showed up to be a supportive audience member. 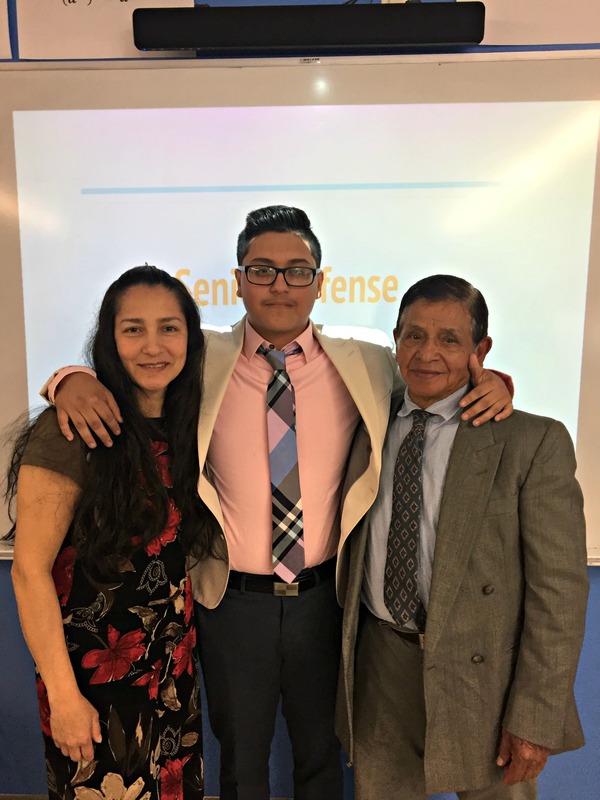 Kentea’s project focused on the importance of early childhood education for all children including bilingual English and Spanish speakers. 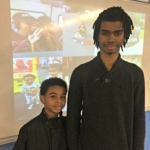 He and his project partner wrote a bilingual children’s book and handed it out with other books to families at the Brennan Rogers Health Community Fair this Spring. Fiona Kelly responds to questions from her panel. 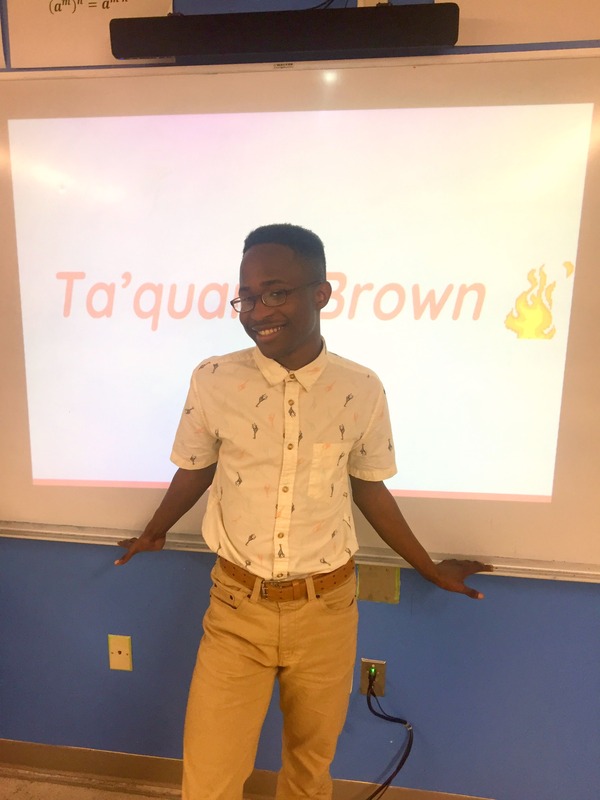 Each senior has a panel of three staff who ask questions at the end of the presentation and offer a score to the student on their written portfolio, defense presentation, and an overall score. 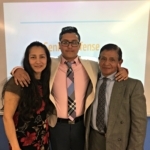 Edwin Calle-Calderon celebrates the completion of his defense with his proud parents. In addition to sharing two leadership experiences, each senior talks about their senior project. Edwin focused on empowering youth through teaching first aid and CPR and ran a workshop for Common Ground students during our Mix It Up Day! Idonia Thomas started by acknowledging her friends and family who helped her become who she is today. Each senior presents two leadership experiences (one academic and one program). 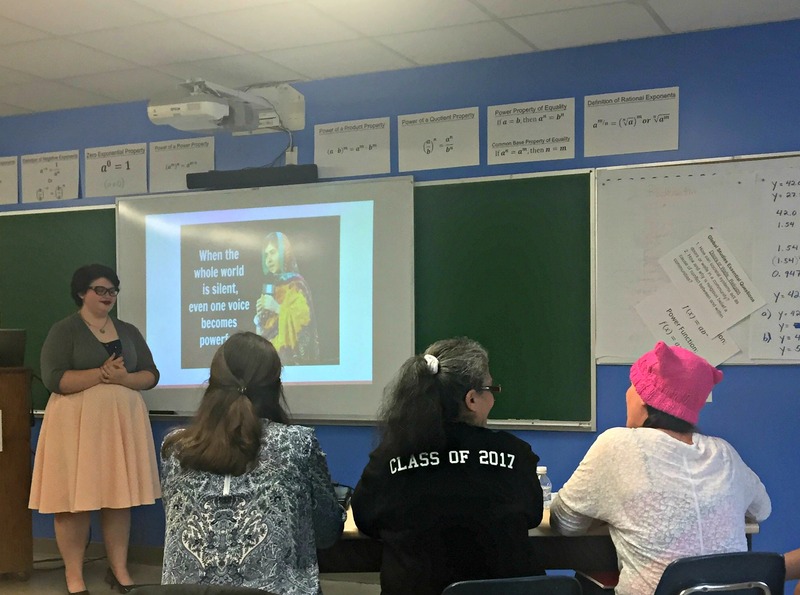 Idonia spoke about her work as a peer educator with Planned Parenthood and her experience in AP Language and Composition. Next year Idonia will be attending Western CT State University.